We just cannot stop the bleeding on the fifth movie in the Friday The 13th film franchise. Twenty seven years later it is still being dumped on, now by Internet websites! 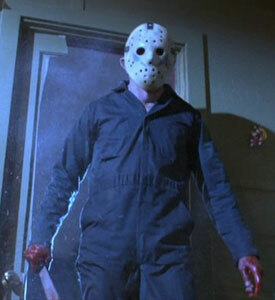 Although we have seen a more balanced following of positive and negative views of Friday The 13th: A New Beginning of late, the film still draws the ire of many fans who just cannot let go of the fact that Jason is truly not the killer. Proponents of A New Beginning like to point out that it is the last film in the franchise to give the vibe of what its predecessors did, which was the unseen killer with tension, grit, and engaging characters. None of that has dissuaded Total Film from pointing out that the film is one of the worst Horror sequels of all time in their new Top 50 Worst Horror Sequel list. Apparently, the staff at Total Film despise A New Beginning so much that they think it is a worse sequel than Leprechaun In Space (Ranked 17). So, where does Roy Burns and his mechanics suit and blue chevron laden hockey mask rank? Third worst! That's correct, it is viewed as the third worst Horror sequel of all time. Even genre fans that hate the movie can't agree with such a high ranking, right? What do you guys think? Does it deserve such a high ranking among some of the worst stink pile of sequel films in genre existence? Is there a worse sequel than A New Beginning in the Friday The 13th film franchise?